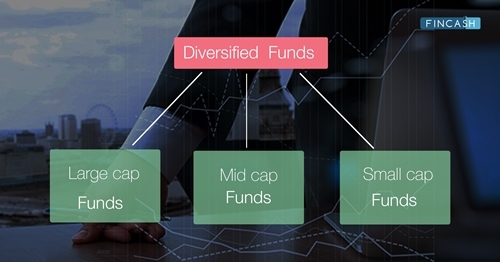 What are Diversified Funds or Multi Cap Funds? Why to Invest in Diversified Funds? In the game of Investing, where returns are essentially important, somehow risk-adjusted returns is what eventually counts. And to strengthen the risk-adjusted returns if one has a long-term view, diversified equities can prove to be beneficial. Diversified funds have historically proven to come out as a winner in most market conditions given long holding periods. They invest across all spectrums of capitalization, within permitted risk levels. But are these funds for you? Let’s find out. Diversified Equity Funds, also known as Multi-cap or Flexi cap funds, invest in stocks of companies across market capitalization i.e.,-large cap, mid and small cap stocks. In other words, they have the flexibility to adapt their portfolios according to the market. They typically invest anywhere between 40-60% in large cap stocks, 10-40% in mid-cap stocks and about 10% in small-cap stocks. Sometimes, the exposure to small-caps may be very small or none at all. Diversified funds do not have any limitations on market caps from an investment point of view. They don’t follow a sectoral approach, instead adopting a growth or Value investing strategy, buying stocks whose price are relatively lower to their historical performance, Book Value, earnings, cash flow potential and dividend yields. These funds balance out the risk and reduce the volatility that usually comes with stock investments by investing across market capitalizations and sectors. Larger companies (large caps) tend to perform better during tough market times than the smaller companies, and they can provide investors with better investment returns. Mid-cap stocks can stabilize portfolio returns with higher growth potential than the large cap stocks and less risky than the small cap stocks. However, irrespective of the market caps, all stock investments carry a certain level of risk, and investors should closely monitor their investments as business conditions can change daily. Given that the underlying investment is equity, there is a risk of loss of capital that can occur in the short term. Nevertheless, diversified funds have exceptionally performed well over past 5 years, especially after elections, returning 23% p.a. and 21% p.a. for the last three and five years, respectively. The foremost advantage of diversified funds is that it reduces the need to keep a track on multiple funds in the portfolio distinctly. As the monies are invested across market capitalization, the need to maintain separate Large cap funds, mid and Small cap funds is eliminated. During bull market phases, diversified funds tend to outperform large caps (in the long term) by capturing some of the upside offered by small and mid-cap funds. In the bull market rallies, the large-cap valuations (P/E multiples) run up faster to a point where they appear stretched, in such scenario mid-cap stocks tend to outperform. Since, diversified funds have all three large cap, mid cap and small cap companies in their portfolio, they have potential to deliver good performance on a consistent basis. In the bear market phases, small and mid-cap stocks tend to suffer sharp declines and liquidity issues. Also, consequently, they face liquidity constraints when redemption pressures increase during phases of bear markets, especially when investors are exiting investments. On the other hand, diversified funds don’t face liquidity problems as much—as large cap stocks comprise a sustainable portion of the portfolio. Diversified funds are suitable for investors who start with just one fund and still want to invest across market caps. Also, investors who are not sure of their risk tolerance levels can take advantage of diversified funds. Fund managers of diversified funds invest in companies of all sizes i.e. large, mid, small cap, based on their long-term growth potential. They also change their portfolio allocations between different sectors from time to time, to maximize fund the performance within defined investment objectives. Investing in diversified or multi-cap funds helps to prevent the tendency of investors to switch between large cap funds and mid-cap/small-cap funds based on short-term performance. Diversified funds may suffer massively if the moves are extreme, during falls of the markets, diversified funds are affected from than large caps. This is due to the fact that during most declines, the fall in small & mid-caps is much higher. This can lead to higher volatility of returns, causing these funds to have a higher Standard Deviation, which is one of the important parameters to measure a fund's risk. Larger the standard deviation, higher will be the level of risk. An investor who has a moderate-risk appetite and who wishes to have an exposure in equities can park their funds in diversified funds. Also, investors who are not well-versed with the technique of Asset Allocation in respect to investments can also put a part of their funds here. Investors incline towards investing in these funds as it holds a mix of stocks across market capitalizations. Any high degree of volatility shown by either small cap or mid cap funds can be balanced by the stability provided by large-cap equity funds. However, the returns from such diversified funds are vastly dependent on the fund manager’s knowledge and intelligence as to how he is able to include stocks as per the market conditions. In this situation, there is a probability of fund manager going wrong in his allocation strategy. That is why it is advisable for investors to study the record of the fund manager before investing in diversified funds. When making a long-term investment, investors are advised to take into account their risk appetite. Investors who wish to invest in equity funds should smartly allocate funds to their portfolio. However, there are no hard and fast rules, investors should see the level of risk they can take and then decide the funds to invest. Investors could thoroughly study these funds and invest according to their investment objectives by adding the Best diversified funds to their portfolio.